Your vendor's office is flooded and it looks like they're out of commission for a while...what happens next? Your financial institution benefits from knowing how quickly vendors plan to recover from certain business impacting events. Otherwise, it could impact your operations and reputation. 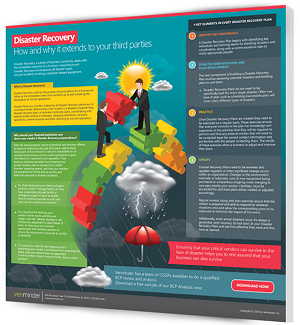 You need to make sure you have appropriate measures and plans in place should disaster strike, and you can start with our Disaster Recovery infographic.